Students at the International School of Louisiana in New Orleans. In 2011 the school received more applications for its French program than ever before. 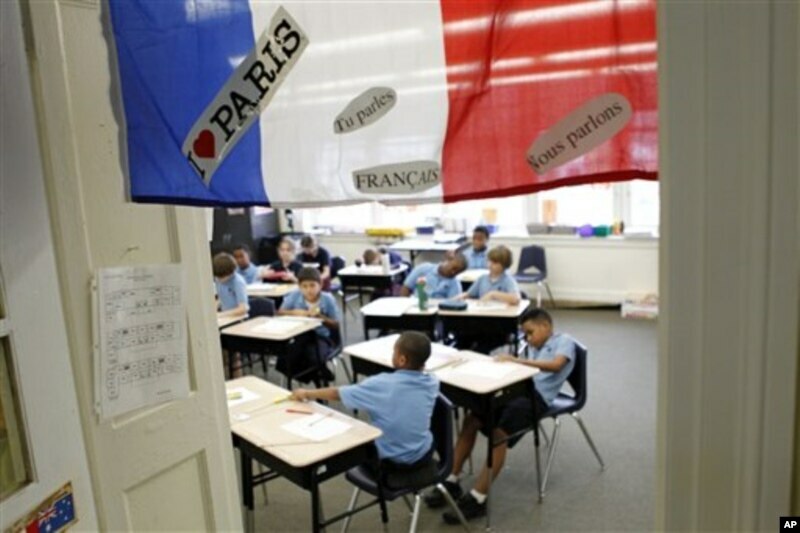 All 29 of the state's public French immersion programs had waiting lists. What is the best way to learn a new language? A small study of foreign language learning in adults compared two methods. One is known as the explicit or classroom method. This is the kind of traditional classroom teaching where students are taught a lot of information about grammar rules. The other method is known as the implicit or immersion method. The idea here is to learn much the way children do when they learn a native language. That is, by being with native speakers and absorbing the language that surrounds them, generally without a lot of explanation. Teachers may combine these two methods into what Professor Michael Ullman calls immersion-style classroom teaching. But is that necessarily a better way to learn a language? Mr. Ullman was the senior investigator for the new study. He is a professor of neuroscience at Georgetown University Medical Center in Washington. He says he was surprised to find that combining the two methods might not help the brain in processing the new language. MICHAEL ULLMAN: "You know, if my life were on the line, and I had to learn a language, what would I do? I'm not sure. One possibility would be that, to start with explicit and then go to immersion, right? Start with classroom and then go to immersion. But there is this possibility that classroom could hurt later immersion. That's what, you know, one possibility of interpreting our data." The Public Library of Science published the study earlier this year. The twenty-one adults in the experiment learned Brocanto2, a thirteen-word language created for the study. The words and grammar rules relate to a computer game similar to chess that the learners played. For example, "Blom neimo lu neep li praz" means "The square blom-piece switches with the neep-piece." The researchers tested the people three to six months after they had learned the language, to see how well they could remember it. The study found that those who had learned it with the immersion method had brain waves similar to those of native speakers of a language when speaking that language. Professor Ullman says those who trained with the classroom method also became more native-like in their brain processing. But only the immersion group showed full native-like processing of the grammar. Still, he says teachers should be careful how they use the results of his study. MICHAEL ULLMAN: "You know I would not make any curriculum changes based on this. Nevertheless, it is suggestive, and I think it warrants further research to see whether in fact what kind of training might in fact be best not just for reaching the native brain bases but also for, you know, maximum proficiency in different aspects of language, like grammar, you know, syntax and lexicon. So I think further research is warranted. And it may be, for example, that a combination of classroom and immersion might be best. But we don't know that." And that's the VOA Special English Education Report, written by Christopher Cruise. You can find a link to the study at voaspecialenglish.com. I'm Steve Ember. Have You Met the Perfect Tenses?